Chicago Review Press, 9781613745441, 144pp. Humans have gazed into the night sky for thousands of years and wondered, What are those twinkling lights? Though the sun, moon, and planets moved across the background of stars, the stars themselves appeared immovable, forever fixed in constellations. Only when astronomers began taking a closer look did anyone realize what a fascinating, ever-changing universe lies beyond our solar system—red giant and white dwarf stars, spiral galaxies, wispy nebulae, black holes, and much more. 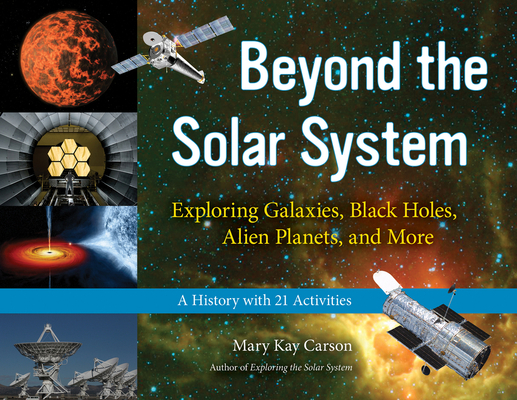 In Beyond the Solar System, author Mary Kay Carson traces the evolution of humankind’s astronomical knowledge, from the realization that we are not at the center of the universe to recent telescopic proof of planets orbiting stars outside our solar system. In addition to its engaging history, this book contains 21 hands-on projects to further explore the subjects discussed. Readers will build a three-dimensional representation of the constellation Orion, model the warping of space-time caused by a black hole, see how the universe expands using an inflating balloon, and construct a reflecting telescope out of a makeup mirror and a magnifying glass. Beyond the Solar System also includes minibiographies of famous astronomers, a time line of major scientific discoveries, a suggested reading list, a glossary of technical terms, and a list of websites for further exploration. Mary Kay Carson has written more than 30 nonfiction books for children, including The Bat Scientists, Exploring the Solar System, and The Wright Brothers for Kids.